This is a guest post from Amy C., who is a tabletop fountain aficionado. She enjoys designing innovate water features to create calm and relaxing indoor and outdoor spaces. She also owns a retail outlet known as Tabletop Fountain Store. 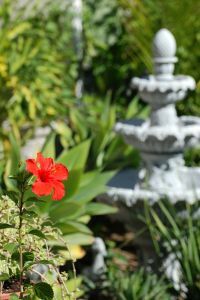 If you are a gardening enthusiast, you would be thrilled to know that it is possible to design your own a solar fountain for a fraction of what a typical solar water fountain costs! A typical solar fountain costs around $130, however, this guide will reveal how to design your own solar fountain for less than $60. The best part is that designing your own solar fountain not only helps you save money, it also helps you express your creativity. A solar water fountain is one of the most essential aspects of an energy independent garden. It helps you create a calm and relaxing outdoors and serves as elegant garden decoration item. A typical solar fountain constitutes of 5 main parts: a solar panel ($25), a submersible low voltage DC water pump($5), a container or basin($10 – $15), decorative fixture or figurine($20), and some vinyl tubes($5). Here’s quick and easy guide on how to effortlessly design your own solar water fountain. Choosing the right combination of solar panel and pump is vital when it comes to designing your own solar fountain. Here are the two most important things you should consider when shopping for a solar panel – Voltage Output, and, Current Output. A typical solar garden fountain needs a solar panel that outputs 6 to 9 volts of electricity and about 180 to 220 milliamps (mA) of current. If you get a solar panel that produces 1 watt of power, it should be sufficient. Choose a low voltage DC pump so as to minimize the power consumption. A typical low voltage DC pump would consume about 6 volts of electricity and 150 milliamps of current. This kind of water pump would give result in a flow rate of about 55 to 65 GPH (gallons per hour). Pick a nice decorative terracotta bowl and use it as a basin. If you chose to give your garden a zen-theme, consider using well crafted bamboo spouts to design a bamboo water fountain. On the other hand, if you prefer a traditional fountain, go with a decorative piece like a lion-head wall fixture, or cascading slate tiers. The important thing to keep in mind here is that your bowl size should be in proportion with the size of your fixture, otherwise it would result in a non-uniform design. Pass the tubing through the basin onto the fixture. Make sure that the tubing is connected snugly to the pump and the fixture. Leaks in the beginning or end of tubing would cause non-optimal water circulation and thereby may damage the pump. If you want to protect your pump from getting damaged, consider using a solar pump controller. It is a must-have for larger units of solar fountains that have higher flow rate of 300 to 500 GPH. The above mentioned resources and guide should be enough to get you started on the path of designing an effectively functional and elegant solar fountain. Kelly says: All the homes that I have lived in as an adult have had very limited outdoor space, and our current apartment is no exception. And, let’s face it, my black thumb hasn’t been much encouragement in trying to make our balconies or patios more garden like. But I like this idea because one of our balconies faces due west, and is big enough to hold a (little) fountain. Not to mention that a fountain would probably attract birds, which would add some excitement to our (indoor) cats’ lives! What are your favorite frugal garden features?